Deep in the black waters of Loch Ness lurks a long-necked, hump-backed monster that for centuries has fascinated those lucky—or unlucky—enough to see it. From the earliest sightings in 565 AD to the Nessie craze of the twentieth century, this creature has been steeped in the world of supernatural strangeness. Join Nick Redfern on an exciting journey into the paranormal origins of Nessie, exploring ideas that go far beyond the ordinary. This comprehensive guide offers lore, unique theories, hot spots, and photographs. Experience firsthand encounters, discover how Nessie is connected to the occult, and meet other mysterious monsters that live in Loch Ness. Nessie presents a fresh approach to the mystery, one that will take you down new and sometimes frightening paths as you hunt for the truth. 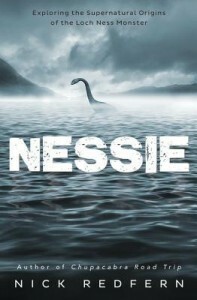 When I saw Nessie on Netgalley, I was intrigued. I read Nick Redfern’s previous books Chupacabra Road Trip, and gave it 4 stars. In that book, I thought the author did an admirable job of getting to the bottom of the mystery, providing both plausible, scientific and less plausible, supernatural, explanations for the origins of the Chupacabra. I also really enjoyed reading about the author’s own investigation visiting the “crime scenes” where the chupacabra had hurt animals, and talking to locals. I expected something similar from Nessie. A run-down of historical research, the author’s own investigation on site, talking to the locals and some other Nessie specialists, and offering a wide range of explanations, from the plausible to the less plausible. Unfortunately, the author lost me almost right from the start. He focuses on the regular explanations (Nessie being a dinosaur, some type of unknown animal, and so on) for a very brief timespan, maybe a chapter at most, and then jumps straight into the supernatural. It’s not even that I mind the supernatural as an explanation for Nessie – it’s that I doubt it’s the only possible one. Also, the book goes into so many different directions, always jumping back to names mentioned chapters prior, and telling stories that have little, or nothing to do with Nessie. For example, the author devotes several chapters to Alastair Crowley, who spent some time in a house near Loch Ness, yet only said one or two things about Nessie – yet the author thinks this warrants a lot of page time, in regards to the Nessie investigation. There’s also mention of several other wizards/ warlocks, similar to Crowley, who may or may not have had anything to do with Loch Ness. The author likes to explain everything away by blaming it on the supernatural. You can’t take a decent photograph of Nessie? Must be paranormal. Nessie appears different to several people? Must be a) there’s several Nessies and b) it’s paranormal. The list goes on and on. The author also refers to high-strangeness, and to how some people’s lifes were forever influenced after they investigated Nessie, as if something paranormal warned them to stay away. Then there’s also a chapter on UFO’s, men in black, and really, there’s no end to all the strangeness mentioned in the book. It was over the top. Is Nessie paranormal now, or is she an alien? I expected this book would debunk some theories regarding Nessie, and investigate some other theories, or the author’s own theory, but it focuses primarily on the paranormal theory, and hardly tries to debunk the others. After reading it, I don’t know much more than I did before – I still don’t know what Nessie is, but my money is still on a prehistoric monster / animal we simply haven’t encountered yet, rather than a paranormal shape-shifting kelpie.